A team of specialist inflammatory bowel disease specialist nurses have got together to run next month’s Lincoln 10k for charity. Caroline Hayhurst, Toni Roberts and Debbie Pomeroy are running the annual city race on behalf of the Crohn’s and Colitis UK (CCUK) charity, to help raise awareness of the chronic disease Crohn’s and ulcerative colitis IBD. 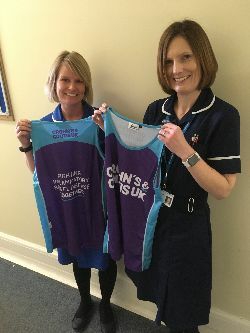 Pictured are both Caroline and Toni, sporting their charity running vests. Debbie is currently on a career break and due to return in the summer. “We are also hoping to raise some funds for our local branch of the national CCUK, who do a wonderful job at supporting our patients in a variety of ways,” said Caroline. If you’d like to sponsor the ladies – visit the JustGiving page.